Researchers at the Ottawa Research Institute report that resveratrol still exerts anti-cancer action, sometimes in profound ways, but that the Sirtuin1 gene is not always required to produce such an effect. 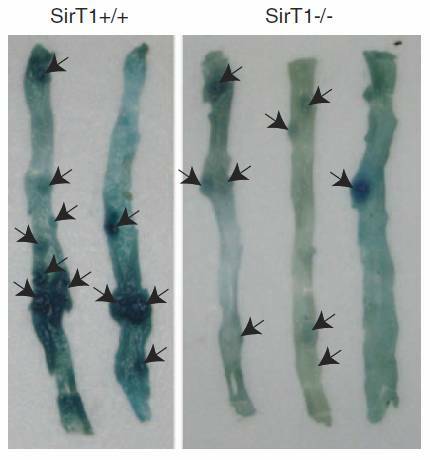 Mice bred without a functioning Sirtuin1 gene did not develop fewer intestinal polyps (see graphic below). The assumption is that Sirtuin1 is a survival gene that is switch on in calorie restricted animals who have double the lifespan of animal fed a normal diet. Resveratrol is a molecule that is purported to activate the Sirtuin1 gene. But subsequent studies don’t always validate the idea that the Sirtuin1 gene is a strong anti-cancer gene. In fact, Sirtuin1 gene proteins are produced at a high level in lymph gland tumors (B-cell lymphomas) and are accompanied by a poor prognosis in B-cell lymphomaand breast cancer. If the Sirtuin1 gene has a general function in forestalling the onset of age-related diseases, we predicted that Sirtuin1 would have tumor-suppressive activity and that Sirtuin1 mice would develop tumors at precocious rates. This prediction was not confirmed in two in vivo experimental tumor models or in one in vitro cell transformation assay. We found that Sirtuin1-null mice did not differ from normal littermates in terms of incidence or tumor load. However, resveratrol had a profound inhibitory effect on skin carcinogenesis in normal animals and a much less remarkable effect in the Sirtuin1-null mice. Thus, the beneficial effects of resveratrol are partially though not entirely dependent on the presence of the Sirtuin1 protein.